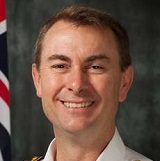 Commodore Chris Smallhorn is the Commander of the Fleet Air Arm of the Royal Australian Navy and is at the forefront of creating a culture of innovative behaviour. CDRE Smallhorn’s innovative behaviours directive seeks to implement the Chief of Navy’s vision in Naval Aviation. Commodore Smallhorn is also a Director of Safeskies Australia, which delivers an international aviation safety conference in Australia on a bi-annual basis.